Buy the Farm . . . Share: Quesidilla? I Chardly Knew Ya! Hey, everybody! Not only did I utilize a large portion of our farm-fresh produce (and other random crap we need to get out of our pantry) but I even had time to come up with this awesome entry title! Jen doesn't think it's a very good pun. She's of the school of thought that it needs to make sense on some level. That's where she and I differ. I think it's quite strong. A critical ingredient that needed to be used was our strawberries so you will see them heavily featured in this meal. 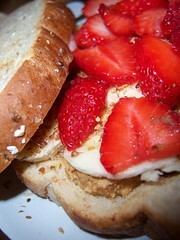 In fact, for my mid-day snack I made myself a sandwich with cashew butter, banana and sliced strawberries. 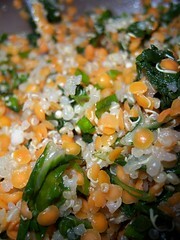 For dinner, I cooked down the Swiss chard and tossed it together with some cooked red lentils and quinoa. 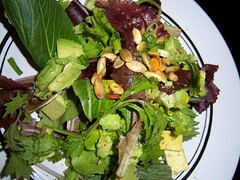 For the salad we used some more salad greens, toasted pepitas, avocado, lime juice, salt and pepper. I marinated the chicken with lime juice, olive oil, thyme, oregano, cumin, cayenne, chili powder, scallions, garlic, salt and pepper. 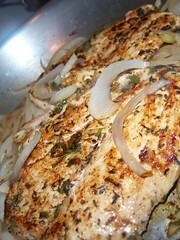 Then I seared the chicken breast with carmelized onions. The quesadilla was the most risky part of the meal. I had it in my head that I was going to make a quesadilla that heavily featured our turnips. Sorry, our Hakurei turnips. 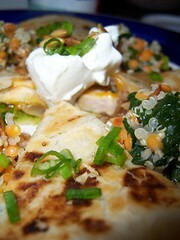 As you may be aware, turnips are not among the most popular ingredients featured in a quesadilla. I wanted the turnips to be the primary flavor so I cooked them down with the same spices I used in the chicken marinade. The quesadillas also had avocado, chicken, cheddar cheese, carmelized onion and green onion but the turnips were still the stars. The complete meal worked together pretty well. I'm not sure exactly where any of the concept or execution came from but it was certainly different. For dessert, more strawberries! 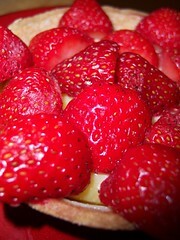 Strawberry tart and . 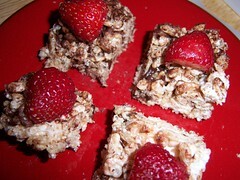 . .
Rice Krispie treats with strawberry! The Rice Krispie squares also used up a bunch of Rice Krispies, marshmallows and chocolate we had lying around. Slowly but surely all our produce and our odds and ends from our pantry are being used up! Sure, the results may be in the form of a strange turnip quesadilla, but the point is that they've been used up and that's what really matters! Tomorrow we have a guest over to experience the fruits (and vegetables) of our farm share. We're winding down already so hopefully we have enough to make something interesting. 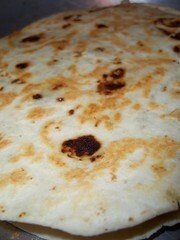 I've got some tortillas left so if all else fails: Rice Krispie Quesadillas! I have to say, I would not have imagined that a turnip quesidilla would have been a fan favorite, but it was delicious. The flavor worked really well with the sweetness of the carmelized onions, and the chicken was a nice and spicy contrast. The quinoa salad, I think, is going to age really well: I'm looking forward to having it for lunch tomorrow. But the biggest revelation, I think, so far in the farm share has been that lettuces can be a LOT more flavorful than I knew. Lately when we've been having salads made with the green and red leaf lettuces and even the iceberg, there's a distinct lettuce flavor for each, something I never even knew I was missing. That, and the fact that the scallions from the farm are about 3 feet long but super, super sharp tasting, has been an eye-opener. I know people always talk about the first time they have a home-grown tomato or a fresh-from-the-field strawberry as the moment they realized that modern farming practices have robbed the food we eat of so much more than we knew, but for me, it's lettuce. And I have to say, I am sorely going to miss the extra flavor they add to salads and meals when we're back to greenhouse lettuces, no matter how organic or how exotic. Tomorrow: I continue to plagiarize thoughts from "Animal, Vegetable, Miracle" and Nate will continue to create possibly bizarre but always delicious meals!